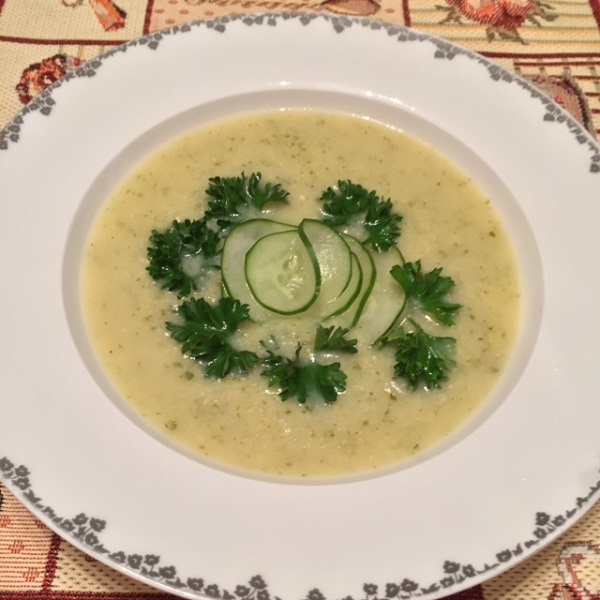 My friend shared with me this recipe for an EASY and healthy summer soup. It takes so little effort to cook that I made it during the fast day of the 9 Av. We broke the fast with this light delicious soup and it quickly became one of our favorites. I used a curly vegetable slicer ( one of many funny and creative gifts from my daughter ) to slice the cucumber for garnishing. 🙂 It takes 10 minutes to make! I had it with zucchini or summer squash – both recipes are delicious! Bring water and kombu to boil. Remove kombu. Pour in polenta slowly, constantly stirring to avoid lumping. Add cubed vegetables, stir well. Return to medium boil and simmer for 7 minutes. Dissolve miso in a little of hot water and add to the pot. Add parsley or dill and simmer for 3 minutes. Puree soup until creamy smooth. Serve garnished with thin cucumber slices and minced curley parsley ( featured ) or dill.